This option isn’t for everyone, but it is a unique capability of QBO. If you sell services to your customers, most likely you are purchasing those services either from contractors or employees. If you sell those services based on time, X number of hours at X dollars each, you need a record of that time in order to invoice the customer/client. QuickBooks Online (QBO) has some features that can help you with this process. 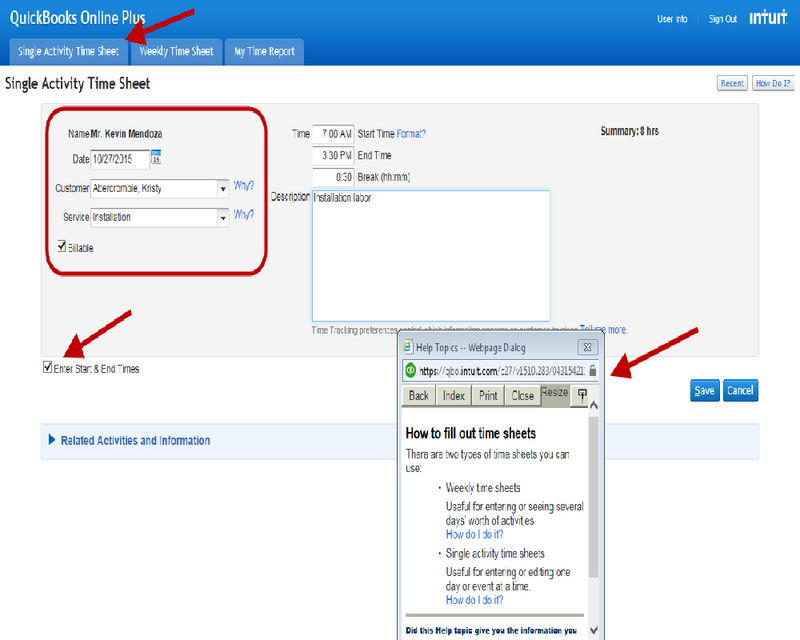 The Plus version of QBO includes time tracking features that simplify the entry and sale of the services you provide. The base subscription for the Plus subscription to QBO allows up to five users. In addition to those five, you can create two accountant users which do not count against the limit of five. The unique capability we want to highlight here, is that you can add even more users without paying additional fees. Users with report viewing only rights and users with time entry rights can be added. An unlimited number at no cost. To see how this works, we’ll setup a fictional example. We have a sample company to use, Rock Castle Construction. Rock Castle provides certain services to its customers. Some of those services are performed by employees, some by subcontractors. All this time must be tracked so Rock Castle can pay for it and invoice its customer. To ease the burden of tracking the time, we’ll let those who provide the service track the time for us. 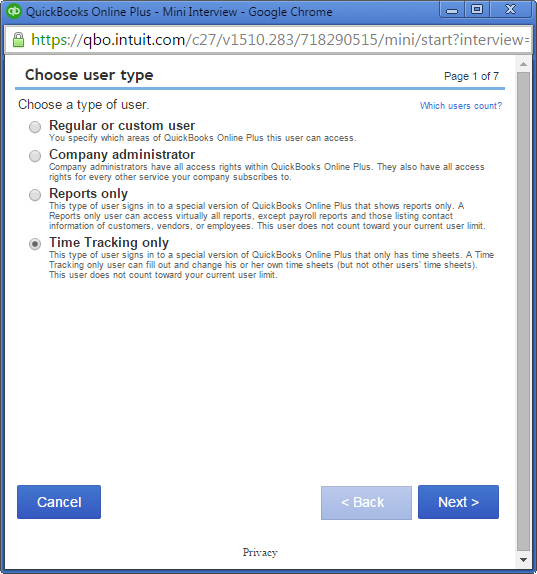 The first step is to set up a new user in QBO. From Settings (gear icon), choose Manage Users. Then Add a new user. Remember, selecting Time Tracking as the user type, means we can add as many as we want. Both the list of vendors and the list of employees is available, we can choose a name from either one. In this case, we will choose a vendor, Mendoza Mechanical. As we proceed through the setup, QBO will ask for the user’s name and email address. We enter the information and continue. QBO will invite the user to setup an account. 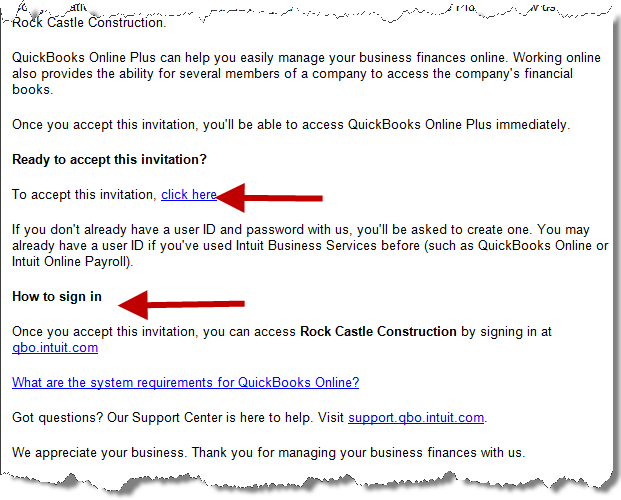 Above, you can see a portion of the email QBO sent to Mendoza Mechanical, inviting them to setup their user account in Rock Castle’s QBO subscription. A link is there allowing the recipient to accept the invitation. There are also instructions for signing in when time needs to be entered. Above is the very simple screen presented to Mendoza so they can setup their user account login credentials. 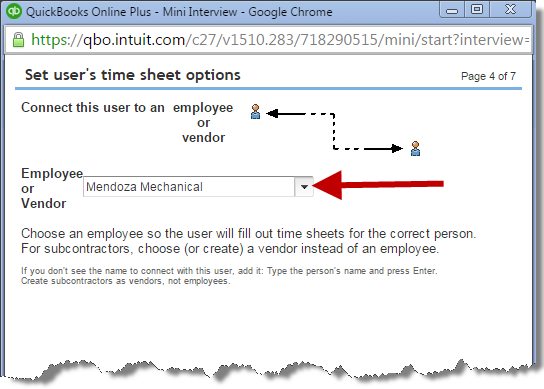 After the one-step setup is completed, Mendoza can access the time activity portion of Rock Castle’s QBO subscription. Here, they can enter time. 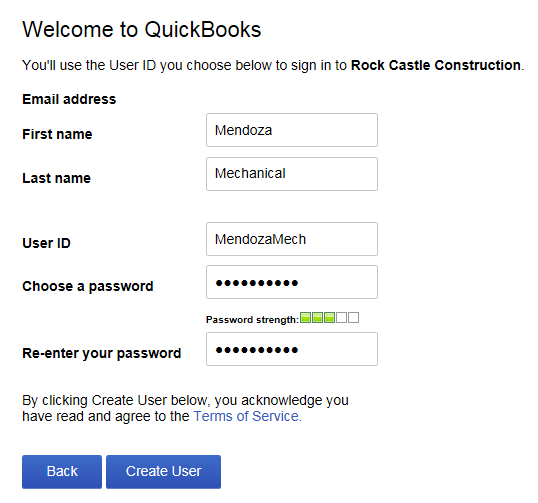 Above is a screenshot of Mendoza Mechanical’s access to Rock Castle Construction’s QBO subscription. How much of the program is accessible is always a concern. But you can see from the screenshot that the other menu items do not exist in this window. There is nowhere else in the software this user can go. Shown is the single activity time entry screen. A weekly timesheet could also be used. Mendoza selects the customer they worked for and what service was performed. They can enter time as a total amount, or opt to include start and end times. There is also a help popup window to answer questions they might have about this entry. Once the time is entered, it is available in the QBO system to pay Mendoza and invoice the customer without further manual entry. Is a feature like this something that would be useful to you?